The presented patient lost all of her existing teeth due to recurrent caries. 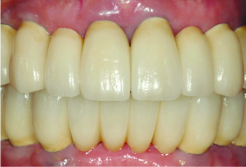 The complete transition from teeth to implants was carefully planned, precisely sequenced, and successfully performed. The patient was satisfied with her appearance and functions with full mouth implant supported reconstruction.